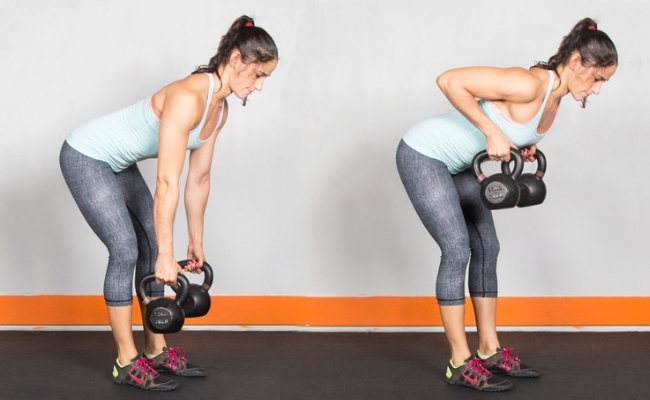 For this move, you have to stand with you legs about shoulder width apart, holding the kettle bell in both hands. Then raise the same using both hands and take it as high as you can go. This can be done about 10-20 times. You can add a little more to this move by squatting before you raise the bell. This way, you work on both the legs and arms together. For this move, you need to hold the kettle bell to the chest using right hand. Then as you keep feet shoulder width apart, go down in th squat. Now take the kettle bell in between the legs. While doing so, change hands and take the bell in left hand. Repeat this move as you take the bell up and down again to switch hands. Like a dumbbell, hold the kettle bell in your right hand. Then squat down and as you stand up, raise the right hand and keep it straight. Now squat again and repeat this move with the left hand. Do in a controlled motion to lose weight. During this move, be careful to not exert too much pressure on just one hand. This is a pose that caters to the side of the body and is a really great move for beginners. It is a move that not only tones and works on the sides of the abs but also helps you stretch the legs. Stand with legs wide apart and hold kettle bell in your right hand and raise it straight. Now gently ben towards the left side and try touching the ankle using your left hand. Do about 15-20 sets. Repeat on other side using left hand. For this move, stand straight and hold the kettle bell in both your hands across the chest. Next, you have to hold this position as you squat down and take the right step further like a lunge. When doing so, take the kettle bell towards the left side. Now repeat with the left leg and take the kettle bell towards the left side. This again works on sides and legs together. For this move, stand with feet hip length apart. Raise both hands above your heads, with elbows bent. Make sure that you are holding the bell right. Now take the kettle bell from the left side to the right as if forming a circle or a halo. This works really well on the upper body. Take left leg towards your side bend slightly, while the right leg remains firm on the ground. Now raise the kettle bell like you do a bicep curl. Now shift the bell to the right side and lunge sideways there. A great way to tone biceps along with legs. Bend slightly from the knees while standing with feet shoulder width apart. Hold the kettle bell in front of you, with elbows as waist level. Then twist from the waist and go as towards the left as possible. Then repeat the move on the right side too. Go as fast as possible to work those abs.